The nuances of color that Pugh refers to can often be found around the edges of mountains or rural architecture, or in the thin space between land and sky. Here, primary colors and pigments are thinly layered, activating the other colors and shapes around them. This technique is called “halation,” which Pugh picked up from studying the landscapes and even food paintings of Wayne Thiebaud, one of his artistic heroes and inspirations. Pugh has recently begun to incorporate this technique into more complex areas of his paintings as well, within field patterns and around focal points such as trees and animals, to give more pulse and depth to his images. 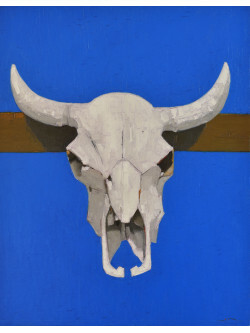 Bones & Bison, Jeffery Pugh’s 2018 Solo Show, opens this Saturday, February 17th from 6-9pm.